NOTICE: Activation key must be used on a valid Steam account, requires internet connection. 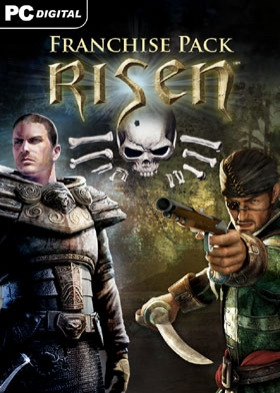 FRANCHISE PACK Risen Risen 2: Dark Waters Risen 2: Dark Waters - A Pirate's Clothes DLC 1 Risen 2: Dark Waters - Treasure Isle DLC 2 Risen 2: Dark Waters - The Air Temple DLC 3 SYSTEM REQUIREMENTS RisenMinimum : Windows XP (with Service Pack 3) 1 GB System RAM 2 GHz Intel® Pentium 4 Single-core P… rocessor 256 MB DirectX 9.1c compatible graphics card (nVidia® GeForce® 7900/ATI Radeon X1800 or better)Recommended : Windows XP or Vista 2 GB System RAM 2.6 GHz Intel® Core 2 Duo Processor or equivalent processor 512 MB DirectX 9.1c compatible graphics card (nVidia® GeForce® 8800/ATI Radeon HD2900 or better)Miscellaneous : 100% DirectX 9.1c compatible sound card 2.5 GB free Hard Drive space Keyboard, Mouse DirectX 9.1c compatible graphic card driverRisen 2Minimum: OS: Windows XP (with Servicepack 2) Processor: Dual Core with 2.1 GHz Memory: 2 GB System RAM, 5,5 GB free HDD space Video Card: 512 MB Radeon 3870 / GeForce 8800 GTX DirectX: DirectX 9.1c Sound: DirectX compatible soundcard. Keyboard/mouse or gamepad required Internet Connection required for online activation. Recommended: OS: Windows XP (with Servicepack 3), Windows Vista (with Servicepack 1), Windows 7, Windows 8 Processor: Dual Core with 3 GHz Memory: 4 GB System RAM, 5,5 GB free HDD space Video Card: 1024 MB Radeon 4890 / GeForce GTX 260 DirectX: DirectX 9.1c Sound: DirectX compatible soundcard. Keyboard/mouse or gamepad required Internet Connection required for online activation.